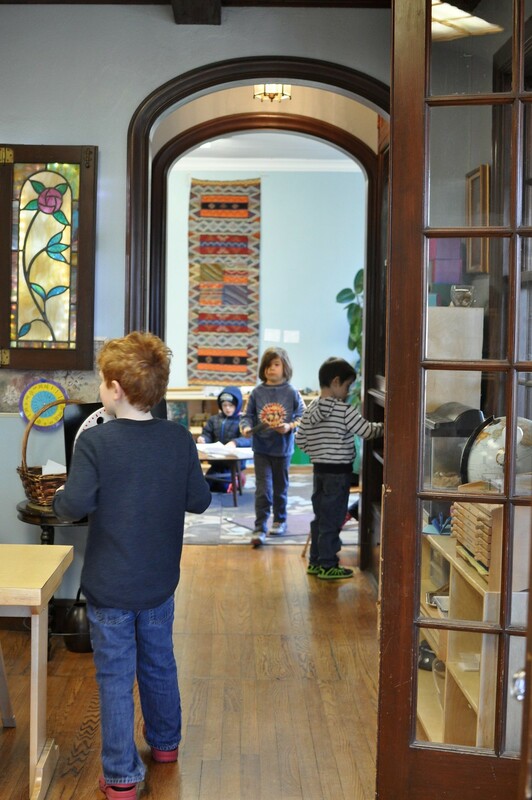 During an observation in the lower elementary Montessori classroom earlier this school year, I was struck by just how much physical movement I saw. Two girls stood by the bells, playing the higher and lower tones, and as one played a higher tone, the other reached high into the air, stretching her body; when her classmate played the lower tones, she dropped quietly to the floor, representing “down” for “low.” Other children were spread out throughout the classroom: some were standing, others sitting at tables or kneeling on the floor, still others spread out on their stomachs on soft rugs as they completed their work. 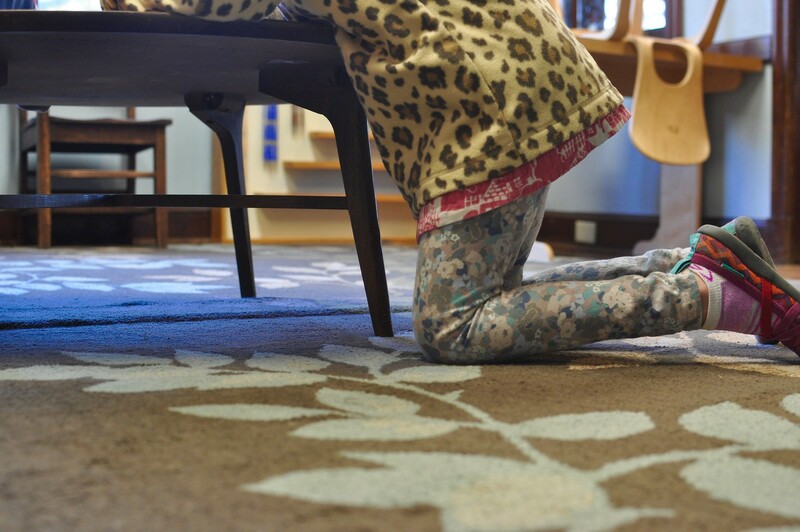 Out of the ten children in front of me (many others work in different rooms connecting the lower elementary), seven work on the floor. Of the remaining, three work at a small table together; one stands in half-splits while working. Children’s bodies move and squirm, shift in seats and stretch out. It is a joy to watch the acrobatics while they learn — there is just so much movement! But to the children, the movement is an afterthought; they are doing what is natural, what is comfortable, and what helps them learn. 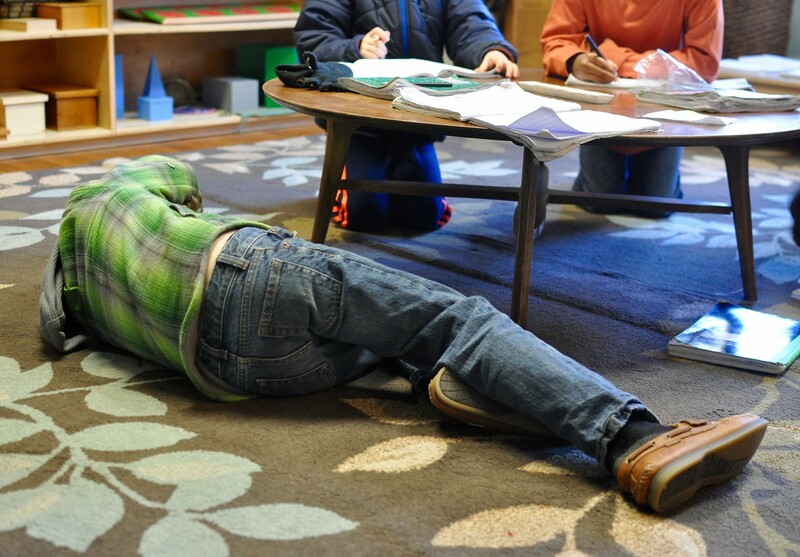 This child was moving around quite a bit (it was first thing in the morning) and took a quick 5-second break to lie down on the floor before sitting up and recording the date in his journal to start his daily work. You can see his open journal on the table just above him. During this photo shoot, I had to switch my camera’s setting to sports mode — that’s just how much these kids move around! 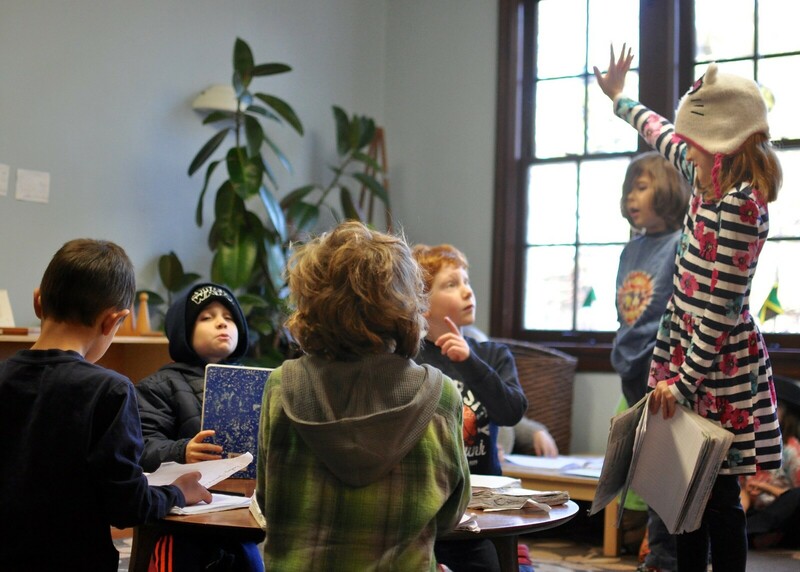 The assumption in many typical classrooms is that movement equals chaos. That children free to move are children free to cause distraction and disruption, but what I observe is the complete opposite. 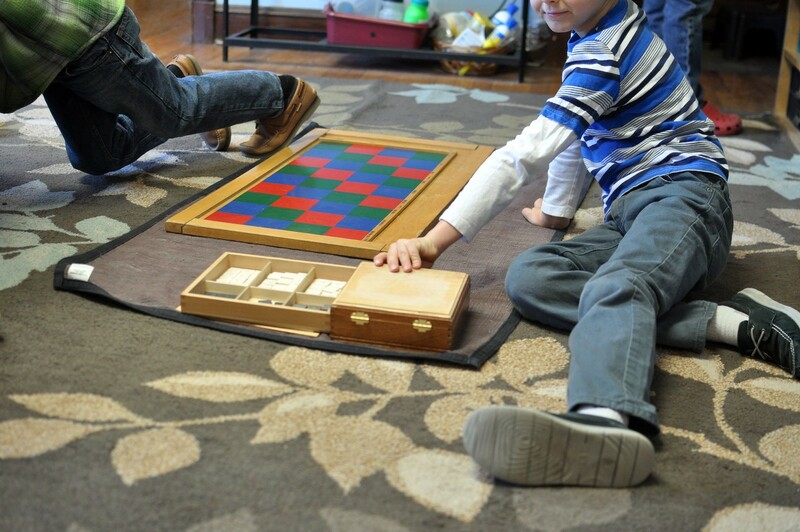 Children are moving purposefully and quietly. 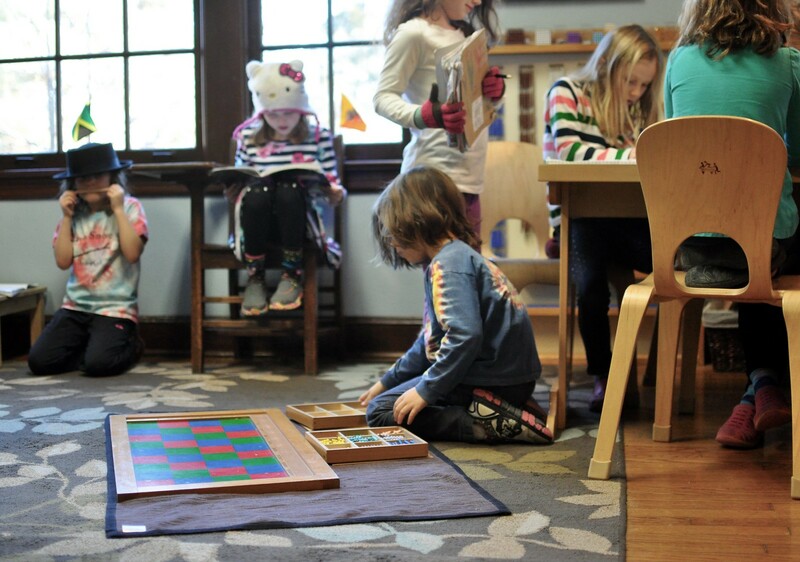 There is the quiet hum or buzz that is so often described in the Montessori classroom that I now understand– of the hushed voices, all are engaged. It makes sense, and there is plenty of research behind why. Mayo Clinic researcher James Levine, M.D., Ph.D., led a project that explored, “Do Children Really Need to Sit at Desks to Learn?” believes that significant educational and learning advances come from giving children the chance to move within the classroom. 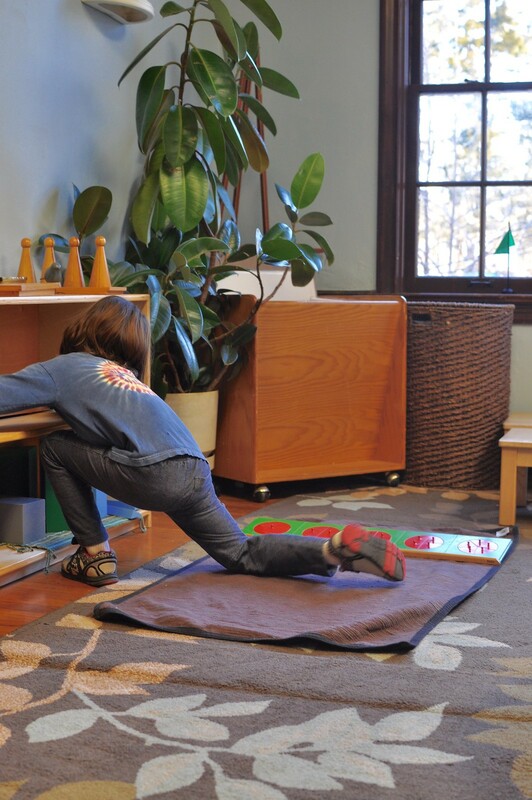 Movement plays a huge part in the development of executive functioning (the ability to establish order and priorities in a work sequence, but also to regulate cognitive processes including working memory, reasoning, flexibility, and problem-solving) in children. 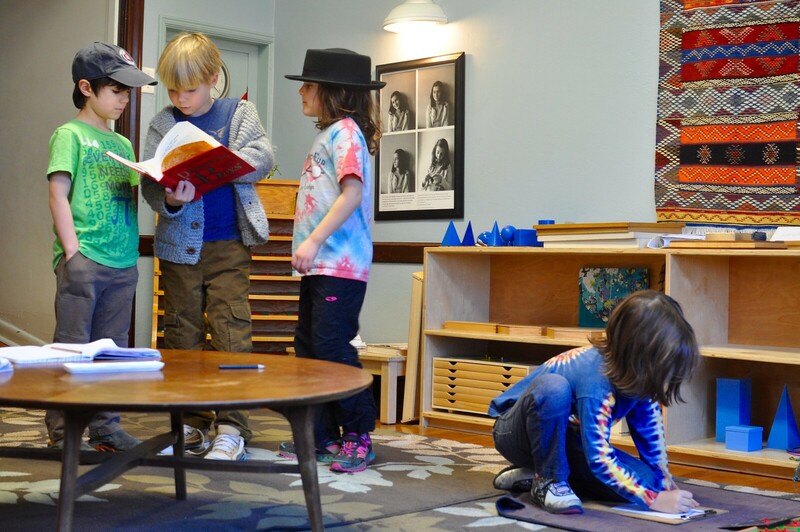 Maria Montessori observed that when movement was part of an educational activity, children were more focused and engaged, and understanding deepened. 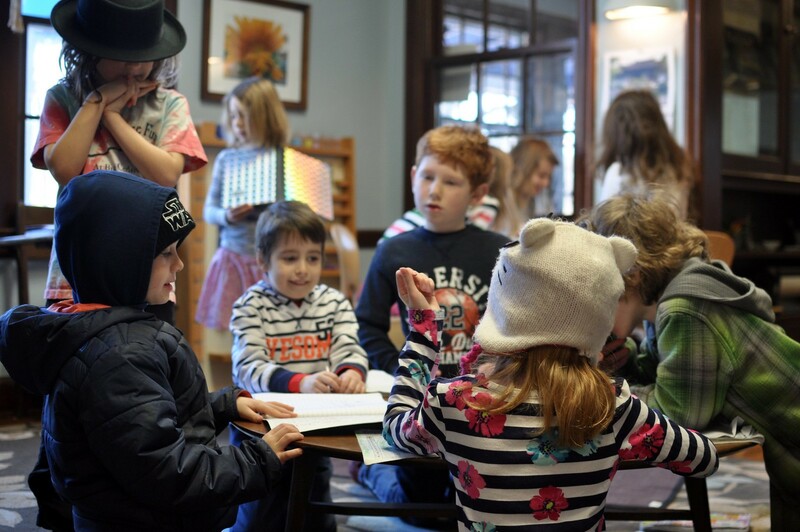 Oftentimes these classrooms are calmer, more peaceful, and quieter than traditional classrooms where children are expected to sit in rows of desks and stay still — perhaps because the expectation is different and the instructors are meeting children where they are developmentally. This group of students spent their first few minutes of the day checking in with each other before getting to work — the child on the far left in the navy coat was telling a story he had written the day before while the other children listened intently. 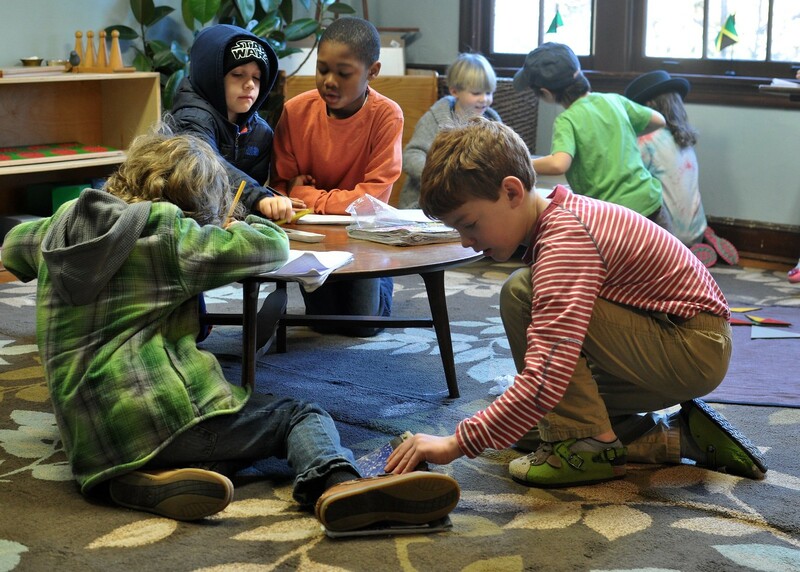 Much of the work these children will do throughout their morning will be collaborative. They check in with each other, help each other, and work together for much of the time. 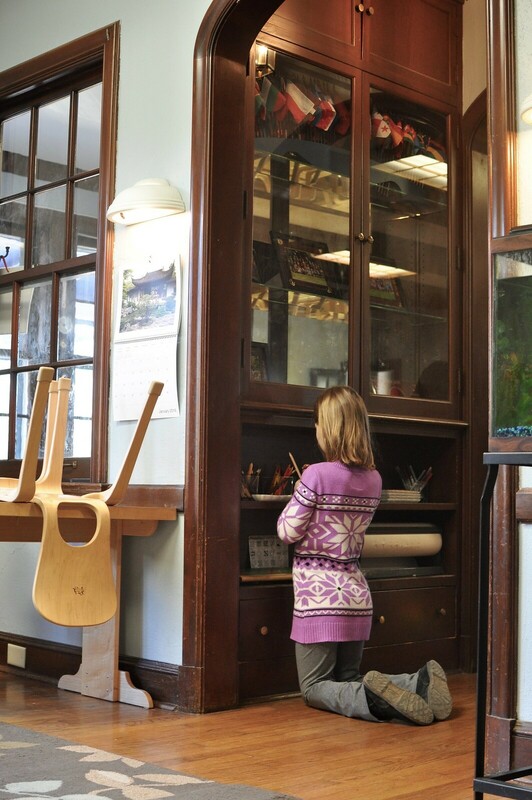 This, of course, requires a lot of moving around the room to accommodate each other, make space, and choose different activities and work. 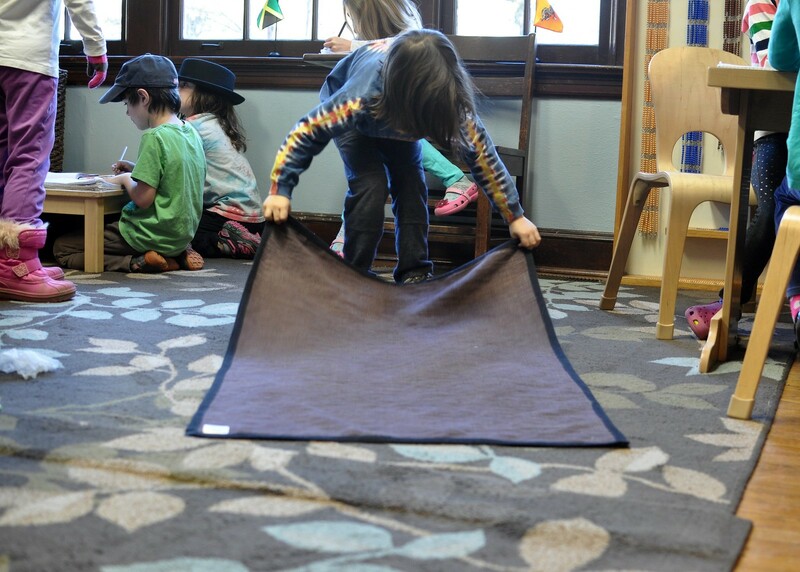 The unrolling and rolling of work mats (meant to delineate personal space and boundaries for each work task) is a very physical part of Montessori. There is research everywhere that suggests physical exercise is healthy not only for a child’s body, but also for his brain. An article in the Chicago Tribune last May highlighted the University of Illinois’ Neurocognitive Kinesiology Laboratory’s study, which found that children aged 7 through 9 who participated in a 60-minute after-school exercise program had better focus, processed information more quickly and performed better on cognitive tests than children who didn’t exercise. In addition, over the last two decades, researchers have learned that exercise acts on multiple levels in the brain, that the brain’s wiring depends on “the integrity of the brain cells or neurons, as well as the connections between the neurons, or the synapses.” Julie Deardorff, Chicago Tribune. 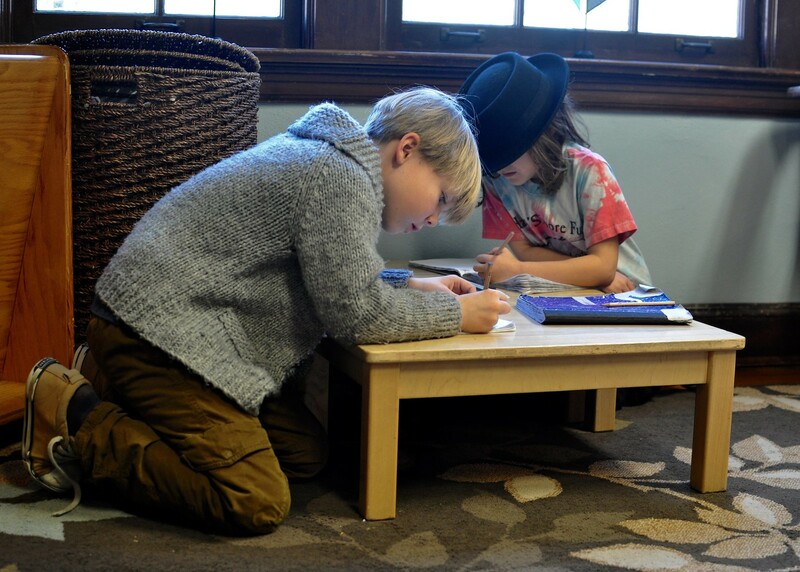 While Montessori education provides many opportunities for exercise and values recess, particularly outdoors in all kinds of weather, it could be argued that the exercise of standing, stretching, and moving around the classroom during work time, the movement that is so natural and everyday during work cycles, is just as crucial to the learning process. 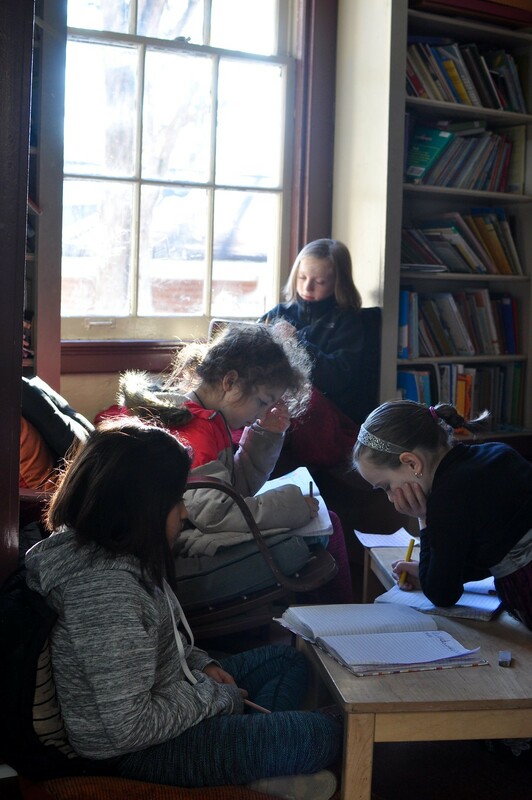 Four students find a quiet, cozy nook in the library where they work in the morning sunshine. It was so peaceful in there, I worked hard not to disturb them! 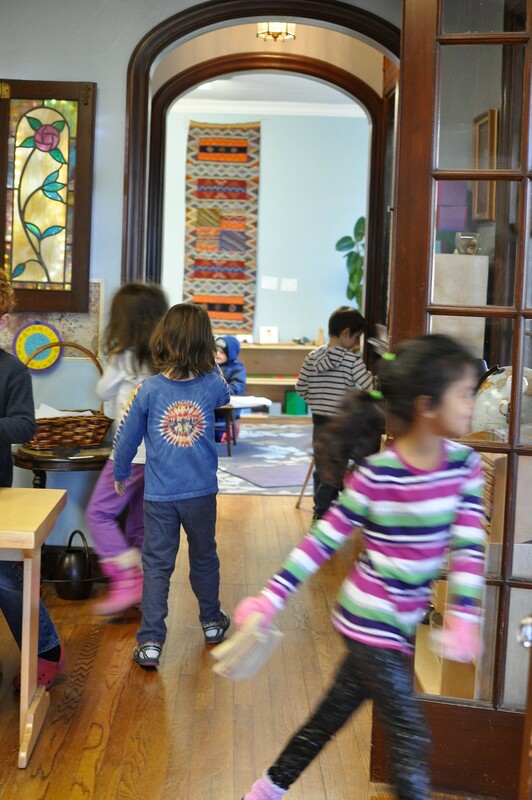 Movement during classroom work time supports the hands-on experiential learning that is the hallmark of Montessori eduction. Such multi sensory learning has been shown in neuroscience to stimulate two memory systems in separate brain regions that can be seen as networked together (Andreason et al., 1999), leading to greater memory retention and comprehension of material. 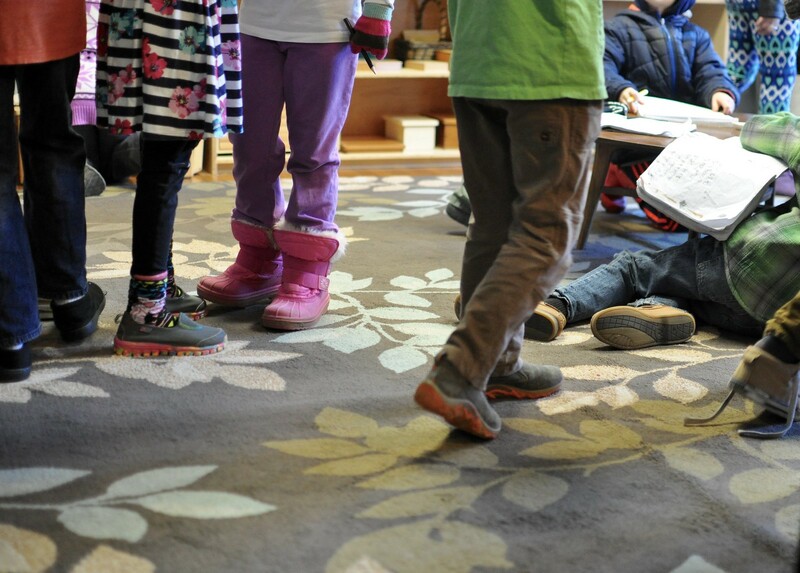 Movement during class time helps to maintain a child’s level of alertness and improves his or her memory recall, perhaps because such movement allows a child to reset or take a restorative “brain break” (which, after a particularly complex lesson, is necessary so that neurotransmitters can be replenished and executive function can process the new material). 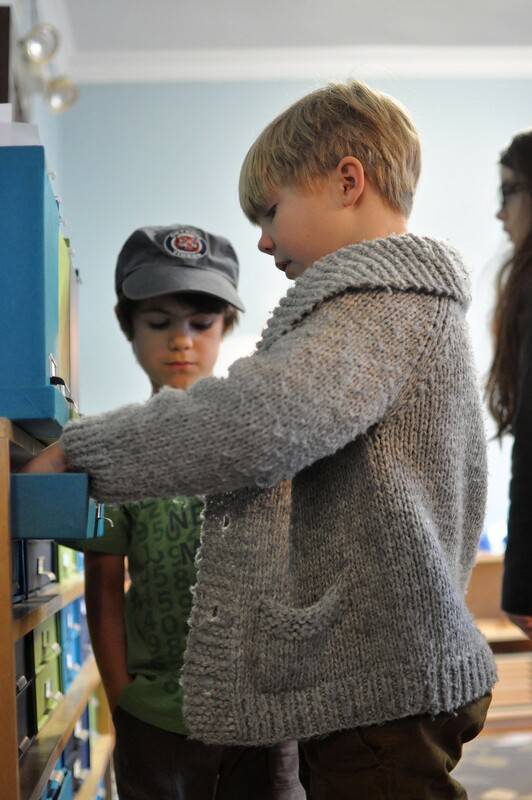 The National Center for Biotechnology Information states that exercise, even in small doses, produces more global changes in a child’s brain function, and these changes appear greatest for middle school and young elementary age children (Tomporowski, 2008). There is no substitute for movement. 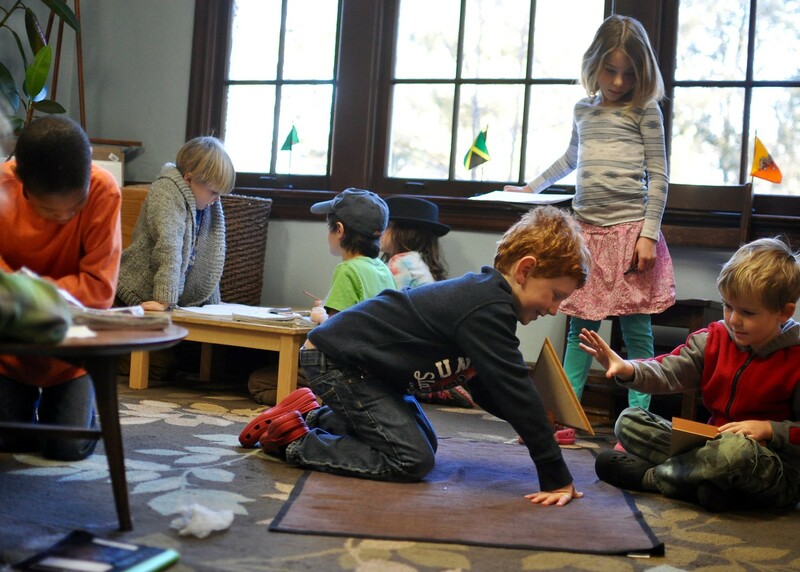 Movement in children is a natural, necessary part of who they are and what they need. 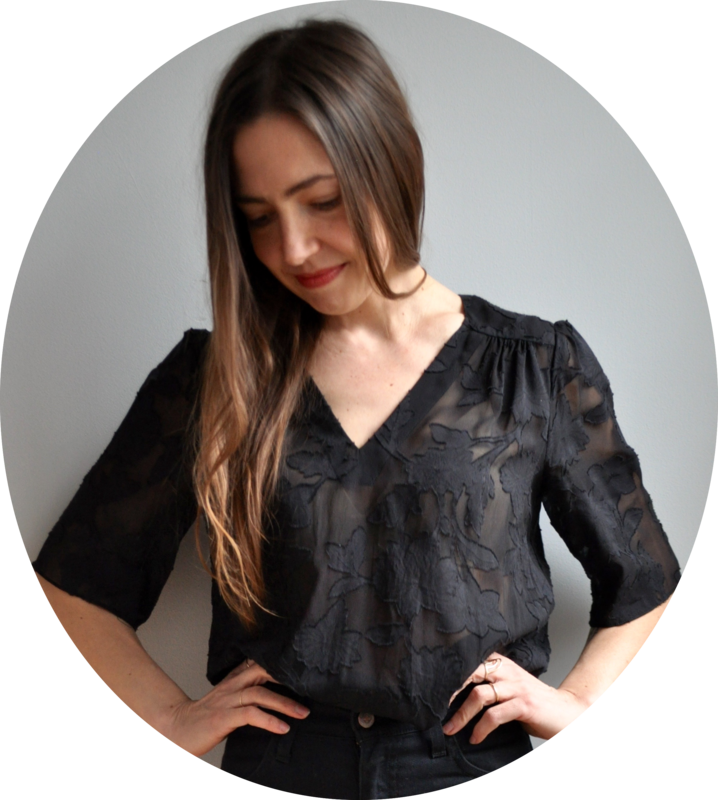 Children and directors alike are taught to embrace movement as a natural, essential, necessary aspect of daily life. What a pleasure to see this in action! Great post! I love hearing stories of excellent education like this. 🙂 Would I be able to share this in the Facebook mom group you and I were in before? How about on my personal Facebook page? Previous Previous post: Dress That Mama: 36!